Teamwriting For TV : The Final Episode. Well, here we are at the end of the creative process in the UWS Module, Team Writing For Television. This 20 Credit module is part of the Filmmaking And Screenwriting Programme at the UWS Skillset Media Academy at the University Of The West Of Scotland in Ayr, and is delivered at Level 9. The class is made up of 60 students comprising 9 Writing Teams, creating 9 Series Bibles, and with each student responsible for writing an individual episode of their team series. Three tutors oversee all the creative elements of the students work, with 3 teams allocated to each. Thus the tutors act as defacto Showrunners.Now, after 14 weeks of intense work, the students have finally handed in their assessemnts. What the written assessments amount to is 9 full breakdowns for a brand new long running television series . Bibles, Scripts, Character Arcs, Viral Ads, Music, Design, and even Springboards for the second series. So rather than being in the customary position , as academic assessors, of surveying 60 separate examples of students work, the tutors are more like directors or producers, sitting down to read a new, integrated creative artefact. We start with the Pilot Episode, usually written by the student whose original idea was adopted by the team, and read on as the series unfolds week by week by week. Each team was jointly responsible for creating the Characters arcs, Series Arcs, Episode Breakdowns and Springboards for the new series. 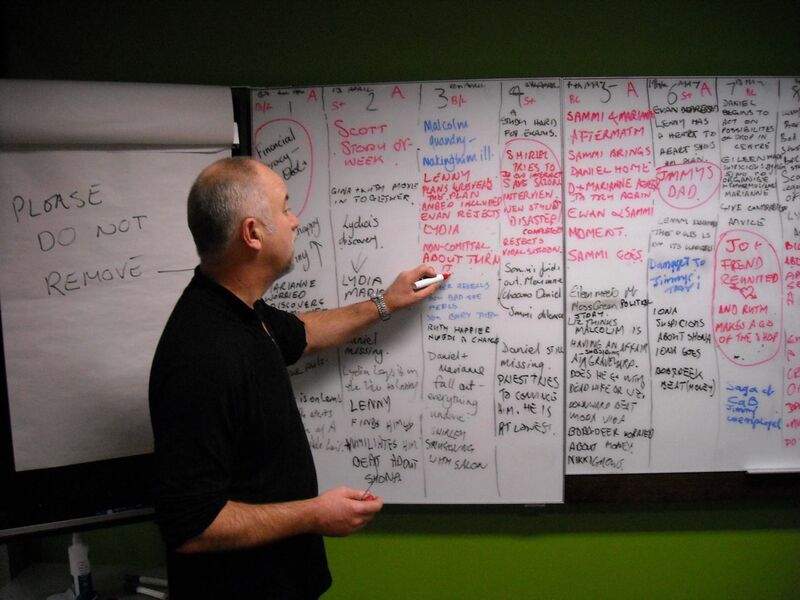 Each team MEMBER was responsible for writing their own individual episode ensuring that it fitted in with the overall plan and development grids. Throughout the process, the teams have engaged with their tutors and one another in a whole series of ways. 1.Weekly short lectures exemplifying contemporary team writing with reference to individual Long Running Series such as True Blood, Glee and The Tudors. 2.Weekly team meetings where the students hammer out the team series grids for a couple of hours, ending with class plenary feedback sessions. 3.Daily Online Team discussions using the Virtual Learning Environment, Blackboard. 4. Nominated Scribes publishing a weekly Team Blog on the VLE evidencing their progress to their classmates. 5. Communicating with team mates creatively in live chats using the Wimba Pronto suite. 6. Publishing their collaborative team bible on their individual Team WIKI. 7. Pitching their Bible in an assessed session to top industry practitioners. 8.Creating, developing and writing their own individual episode, feeding back and forward to their individual tutor through their individual shared ePortfolio. 9. Finally writing their own reflective 1500/2,500 word essay on particular aspects of the creation of Long Running Television Series. This has been a mountain of work, totalling over 2000(and counting) separate messages, posts, ammendments and digital artefacts. Some of it has worked better than we hoped, some of it worse than we might have expected. There have been ICT glitches, team breakdowns and team buildups, but the main thing to say is that the whole has been greater than the sum of the parts. I have been stunned at the quality and coherence of the best work. My colleague John Quinn and I will spend the summer doing a bit of number crunching and analysing student feedback to work out exactly what worked and didn’t work, and why, and we will consolidate this work into developing the module further next academic year. You can expect a paper or two to emerge from this which we plan to publicise in the Autumn. In the meantime, I would like to thank my colleagues, John Quinn and Dr Gill Jamieson, who have supported and encouraged the entire creative experiment. My greatest thanks, however, goes most of all to the students at the UWS School of Creative and Cultural Studies, for their energy, commitment and creativity. I loved this module although it was a bit of a challenge to be in a team writing a Scottish drama in a Scottish accent when i’m an African who has just lived in Scotland for 5yrs. It was quite interesting and the Lecturers were quite helpful. I would love to get some feedback on my episode, Second City episode 6. Thanks for the kind and supportive comments Lydia. If you want to email me sometime and arrange to meet in the office we will go through your script for you.